Wow, it's not THAT blue! It seems that all I ever do these days are what I prefer to call "experiments" Maybe that lets me off the hook when they don't turn out exactly as I envision them.. Maybe all painting is experimental.. that is maybe until one has some sense of control about what one is doing and the results are consistent with the vision.. just pondering.. I really dislike naming paintings/studies..
On another note, I now have plans do a website, at the encouragement of Jesse.. I plan to put past work on it, and just link it to this blog.. The blog will be a "as I do them and how I feel about them" site while the web will have all my work in one place .. easy to view (you don't have to go through the archives) ..
A very busy mind accompanied me when I returned to the studio for an "uninterrupted" day of work this week.. I had so many ideas and images running through my head, it was impossible to settle on any one. Either they weren't interesting enough or required too much research. No one idea stood out.. Even when I randomly selected one, I would immediately reject it.. I felt frantic! Ah, the challenges of being a perfectionist...Enough with this restless crazy mind! After a frantic, unsatisying day of spinning my wheels, I saw that I would just have to wait until it calmed down a bit, which required letting go of any ideas of what I should be doing..
By the next day, it had calmed down and it became obvious what to do.... duh. Some surfers paddle around all over the place, frantically chasing waves, hoping they will be in the right spot at the right time.. often chasing something that isn't even there.. .. Others sit patiently and wait in one spot, knowing a wave will come to them.. 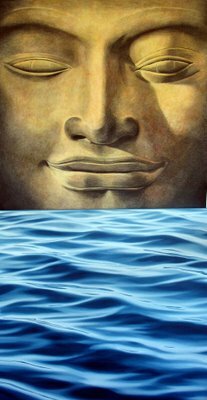 Both are fine, and I do both.. but from experience, I am learning that the calm, patient, focused approach pays off in the end. For me anyway..Yet another life lesson from surfing.. In a burst of energy, I took photos of older pieces , all not related to water.. And of course the fun of playing with the edit feature of Picasa produced some interesting results.. 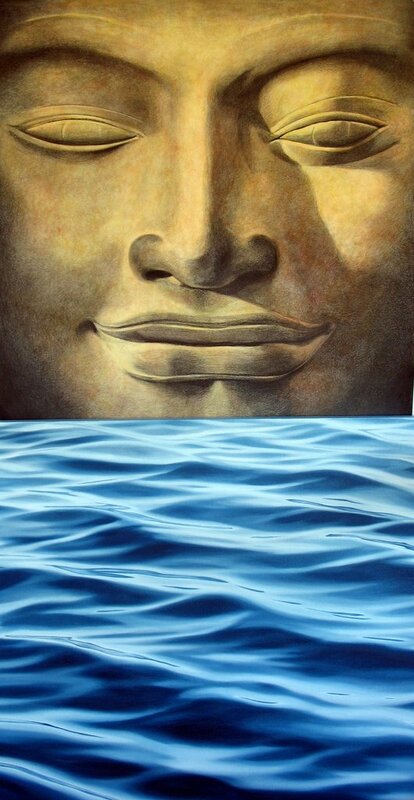 Here's just one..this is large, 3'x6'... the Buddha face is charcoal and gouache on paper, the water, oil on canvas. Oh well just for fun.